Cross-web application aggregations are now possible! 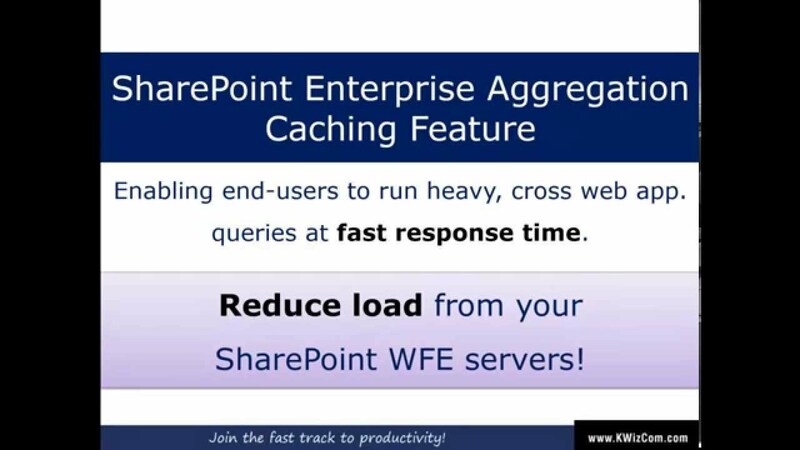 KWizCom’s Enterprise Aggregation Caching Feature is a smart server-based solution that enables end-users to run extensive queries with quick response time and minimal load on your SharePoint Front-End servers! Boost Cross Site Collection/Web Application Aggregation Performance! By executing cross web application queries and storing the results in a farm-level cache, the data becomes accessible to Web Parts that display results. You can use the KWizCom SharePoint List Aggregator web part (Professional Edition), or other custom web parts that can connect to the farm-level cache by using KWizCom’s public API. Once the Enterprise Aggregation Caching Feature is deployed, you can easily run real-time queries of hundreds of lists, located in multiple web applications, each with over thousands of items – the result will be displayed in just few seconds without adding unnecessary server load or sacrificing end-user productivity!